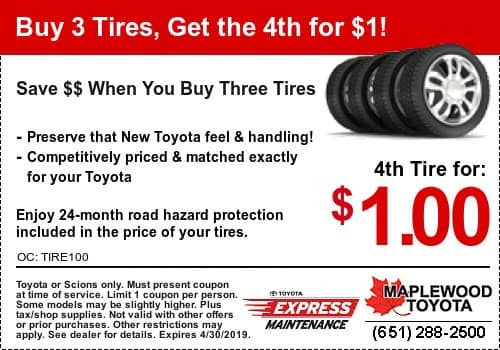 Maplewood Toyota, Minnesota’s largest volume dealer, is equipped to handle all your Toyota auto service needs. Our Toyota Dealer Service Department is staffed with friendly, competent Toyota-trained and certified advisers and technicians ready to accurately analyze and service your Toyota vehicle with genuine Toyota parts and top-quality workmanship. Rest assured that when you bring your vehicle to the Maplewood Toyota Service Department, you’ll be making an investment in your vehicle’s top performance and value. Drop off your vehicle for services and then be shuttled to your destination or relax in our spacious service lounge in front of our 600 gallon fish tank or large screen TV. We provide computer stations and free Wi-Fi. You can also enjoy a cup of Caribou coffee, tea, hot cocoa, or filtered water while munching on a doughnut or cookie. You’ll soon find out why thousands of customers choose Maplewood Toyota for quality and dependable Toyota service. Monday through Fridays, start 7:45 AM and ongoing throughout the day. Saturdays, start 8 AM and ongoing throughout the day. 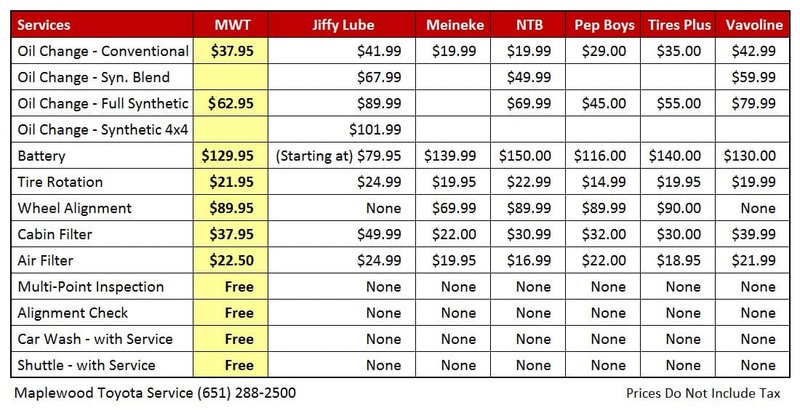 (One way to home or work) Please call our Maplewood Toyota Service Number at (651) 482-1322 for more information. If you stop by before we open or after we close, just fill out one of our car services envelopes from the box on the service door, mark the number of the parking spot where you parked your vehicle, then drop it through the letter slot in the door. We will contact you when we open if you leave any special instructions or questions. Your service is consistently top notch, and you are so honest in telling me when things are NOT wrong, that I totally trust you in the rare cases when something does actually need repair. I will always buy Toyotas because of the integrity of your service department. Thank you! Fantastic customer service by Service Advisor Joshua B at Maplewood Toyota! He was so helpful, upfront and thorough with the options for maintenance on my Camry during my visit last Friday. Keep up the great work!